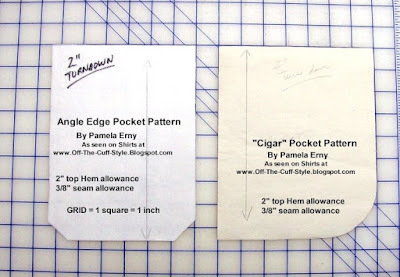 Some of my most popular shirts have featured my "Cigar Pocket"
and the "Angle Edge Pocket". I get many questions about them, so while I had these pocket patterns out on the cutting table, I snapped this pic to share them with you. As you can see below, the dimensions are shown on a grid. The pocket hems are meant to have a double turn of 1", and are drafted with a 3/8" seam allowance. On the "Cigar Pocket", a one-inch slot is made by topstitching the pocket on the straight side, after the pocket is sewn to the shirt.